His decision was ultimately justified by the powerful David Warner, who decided to put Indian fast bowler Varun Aaron to the boundary three times in his opening over. His very first delivery was smashed with precision timing to the cover ropes. The 20,000 or so crowd in the morning would have thought they were attending a Twenty20 match for the first half an hour of the day; Australia raced to 0/40 after just four overs. India’s around-the-wicket approach gifted Warner outside the off stump. His attacking mentality made a statement that he wanted to give former teammate Hughes a flying send off. Chris Rogers barely got any of the strike, such was Warner’s dominance. He was on just two when Warner had made it to 35. Varun Aaron sent down a bouncer early, showing his intentions with speed, but Warner kept putting him away. A tactical bowling change was made, with Ishant Sharma brought on, and the run rate gradually decreased – and so did the aggression from the Australians. Good line and length from Sharma eventually had Rogers undone, swinging at a wide one outside off that was in perfect territory for a drive, but the left-hander sent the ball to Shikhar Dhawan at second slip, out for nine. Shane Watson was greeted with a ripping bouncer first up, but despite a couple of beautiful drives, couldn’t go on beyond 14. Footwork was lacking as Watson sent another catch down the throat of Dhawan, with Aaron picking up his first scalp. The score was at 2/88, but Clarke made his way to the middle, and the script started to play out. Warner continued to pummel and build his innings through clever strokes and attacking leg-spinner Karn Sharma. His 50 came off just 45 balls. Clarke looked nervy early, but some cracking drives seemed to settle him down. 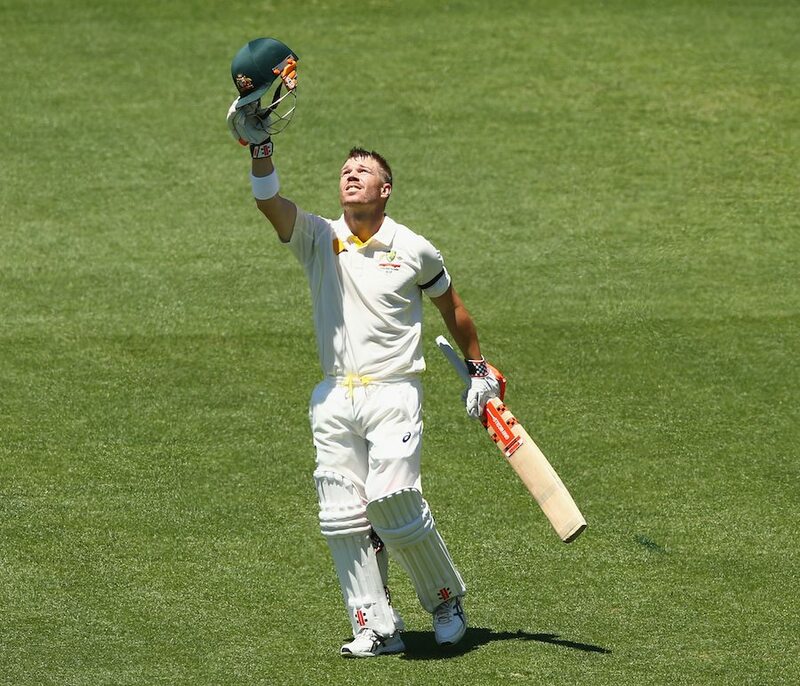 A fitting tribute on 37 not out came from Clarke as he lifted his bat to the sky, but Warner stole the show as he scampered through for a single to bring up his 10th test century – one filled with raw emotion for his teammate in the stars. India’s work ethic seemed to waver after lunch, with Clarke and Warner compiling a 118 run partnership against bowling that offered very few chances for a wicket. A couple of edges flew through slips, but too low to carry to anyone. One bouncer had Clarke reaching, with the score on 2/206, but the reach twinged the skipper’s back. The captain retiring hurt did very little to change India’s momentum, with Warner continuing to put the Indian attack to all parts of the ground. When he finally succumbed to the bowling of debutant Sharma for a magnificent 145 with 19 fours, significant damage had already been done. India went in with just four bowlers – Ishant Sharma, Mohammad Shami, Varun Aaron and Karn Sharma – with a couple of part-timers. Steven Smith, Australia’s best player of spin, once again showed why his form has been praised highly in the media this year, building a 52 run partnership before Warner was dismissed. The talented New South Welshman went to 50 by negating Sharma’s flight, and, like Warner, stopped to salute Phillip Hughes when his score was on 63. Mitchell Marsh, touted as the new all-rounder, continued to negate India’s impact, scoring 41 before being caught by Kohli at fourth slip, with the score on 4/345, not long after the Indian captain had taken the new ball. Australia’s aggression early had India on the back foot, but the visitors simply did not make the most of the conditions. Too many balls were short or wide for the drive, while Karn Sharma was inconsistent in landing the ball on a good line and length. Nightwatchman Nathan Lyon didn’t last long, bowled by Mohammed Shami with just a few minutes left in the day. The damage, however, was done early by Warner and Clarke, before Shami picked up his second wicket of the day, Haddin edging to keeper Wriddhiman Saha for a duck, with absolutely no footwork. From 2/88 to 6/352, Australia had the dominant hand for most of the day, even after Clarke had to retire hurt. The Indians crept back in through persisting on a hot day, and it looks to be honours even after day one. ← Cricket: There’s a test starting soon, are India ready?